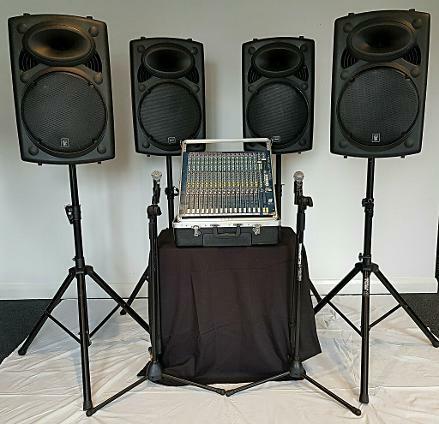 4x QTX QR15A+ stands, mixing desk (up to 16 channel if required), Lapel/Headset microphone system, all cables required. Wireless handheld microphones are also available upon request. This package comes with everything required for holding a conference or public address in an open room or outside. With 4 QTX QR15A's with their stands you get 4 high quality speakers with great clarity to ensure that you can be heard in a bigger size venue. With an Allen and Heath mixing desk, this package can ensure that the possibility of up to 16 microphones can be used to ensure all those wishing to be heard can be; A 4 channel wireless microphone system is provided as standard with either 4 headset or clip on microphones. A hand held wireless microphone and extra wired microphones can be hired as additional extras. All cables required are also provided as standard. This package is also ideal for Speeches, Talks, Lectures, Award Ceremonies as this package can ensure every word is heard. If background music is required or there are visual presentations that require audio to be heard, this can all be connected to the 16 channel desk and ensure that the room is filled with sound. Don't want to be connected to a cable? We have a Line - 6 Wireless Microphone System that can be hired as an additional extra but we may be able to tailor the package to suit you, trade a wired vocal mic for a wireless for no additional charge. Looking for that extra power? Upgrade to 4x 15" 500w speakers for an additional £20!